To become a personality and fully realize his potential, man needs to be engaged in the work of his life. The work that man would put all his mind and soul in. The work that would fill man with enthusiasm, stir up his hidden talents and help him gain an insight into the laws of universe through the on-hand experience. On March 5, 2012 Sergey Viktorovich Gaponov, Doctor of physical and mathematical sciences, professor, academician, laureate of the USSR State Prize for science and technology, marks his 75th anniversary. Just to list all of his scientific and social activities would take most of this page. But the work of his life, no doubt, has been the foundation in Nizhny Novgorod of a research institute under the Russian Academy of Science, the Institute for Physics of Microstructures. The research interests of the IPM RAS founder and the founder/leader of the scientific school for «Metal superlattices and nanocluster structures. Physics and technology of multilayer and nanocluster structures based on metals and superconductors' lie, primarily, in the fundamental science. His specific areas include laser physics, radiation-matter interaction, x-ray optics, superconductivity, physics of solid-state nanostructures. They also cover solution of applied problems, such as development of lasers and laser processing facilities; the physical principles of laser ablation and thin film deposition; development of multilayer x-ray optics, the physics underlying its technology, and some applications; development of the physical principles underlying technology of high-temperature superconductor films and device designing on their basis; construction and application of scanning probe microscopes for research and technological tasks. The entire range of these issues was addressed by Academician S. V. Gaponov in nearly 190 publications. He began his professional career in 1965 after graduation from the Gorky polytechnical institute with a diploma in radio engineering. 1964-1978: technician, engineer, chief engineer, leading designer, head of division, head of laboratory at the Gorky «Salute\' Institute. 1978-1992: Head of division of solid-state technology and semiconductor devices, Head and later Director of the solid-state physics department, vice-Director of the Institute of Applied Physics RAS. 1993-2009: Director of the Institute for Physics of Microstructures of the Russian Academy of Science. 2009-present: Advisor at the Russian Academy of Science. 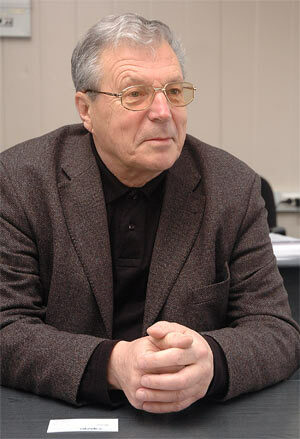 Sergey Viktorovich Gaponov is a USSR State Prize winner (1991) for achievements in the field of multilayer x-ray optics. Department of Education of the Nizhny Novgorod region, Editorial Board of the «Poisk-NN\' journal offer Sergey Viktorovich Gaponov hearty congratulations on his 75th birthday and wishes of good health, happiness, inspiration and fruitful scientific activity for many years ahead!